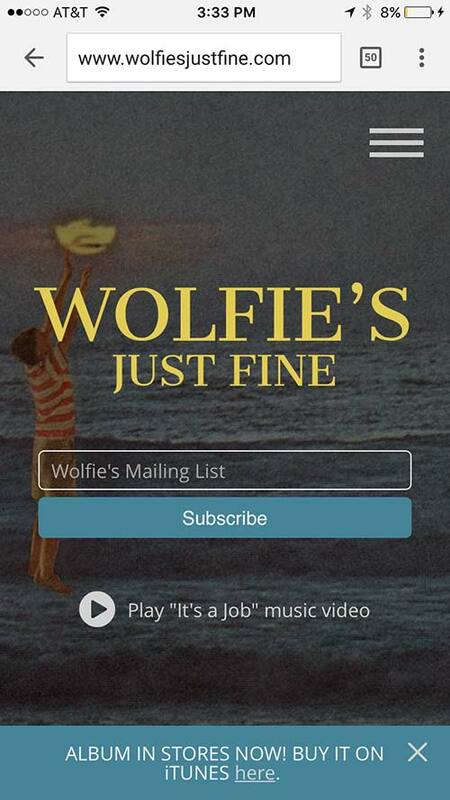 Wolfie’s Just Fine is the band of actor/comedian, Jon Lajoie, from FX’s The League. Wildebeest worked with Jon to bring his vision for the new band’s site to life. Some requirements from our client included the ability to collect subscriptions, promote new material, handle large spikes in traffic, and maintain a close connection with his fans no matter where they’re viewing the site. This band website design and development took approximately a month from start to finish. A new band was born, but an online presence didn’t exist. Wolfie’s Just Fine came to Wildebeest with some inspiring studio tracks and music video for their first single. It was up to our team to understand the driving forces behind the band and create a site that introduces their music to the world. Our client felt strongly about using the NationBuilder platform and after understanding their needs, we couldn’t have agreed more. NationBuilder gives Wolfie’s Just Fine the ability to easily add or update content, scale when traffic spikes, and stay in touch with fans through many different channels. We also used an HTML5 video background to play their new video, “It’s a Job” in the background. When they’re ready to release a new video, it’s a simple CMS control to swap out for what’s next. The creative process is always different from project to project. In the case of WJF, our client is highly creative and looked to us to bring their imagination to the web. We started this project with some initial UI discovery that explored some different ways of presenting the band’s brand and content. As the project continued, we found it most effective to continually iterate on the creative in cycles to ensure our client fell in love with how they look on the web.